On the outskirts of Lisbon, on the northern bank of the Tagus River, is an area called Belem where I spent a long wonderful day. Portugal had been a last-minute addition to my trip so I hadn't done as much research as I normally do, and my "Mediteranean on a Shoestring" Lonely Planet was ancient and falling apart, so I'm not even sure how I found my way here, but it was one of the highlights of my trip. 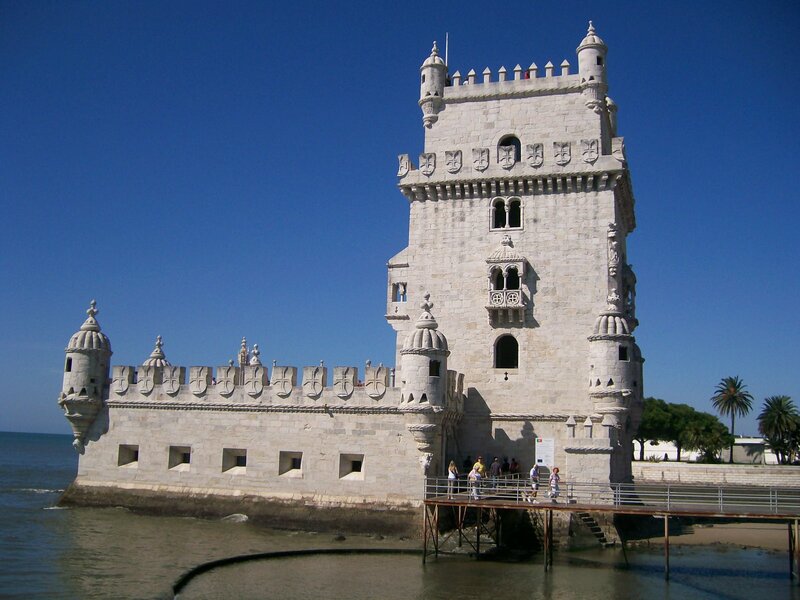 The Torre de Belem was built as part of a system of defense for Lisbon during the early 16th century. The dungeon of the limestone building also served as a prison for about 250 years. 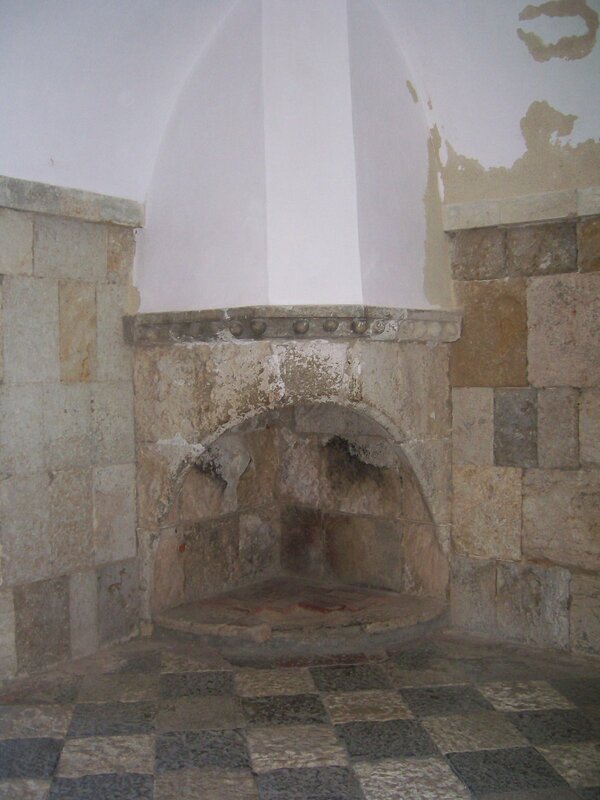 The upper rooms of the tower are reached via a single limestone spiral staircase worn smooth over the centuries. Since it provides the only route up and down, it is usually quite crowded, and I highly recommend holding out for the wide outside part of the stairs rather than the narrow inside. 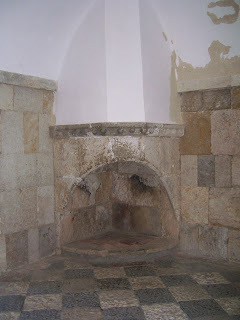 While some areas of the castle were quite crowded, the smaller rooms were cool and quiet. I found myself hiding out there and trying to picture what it would be like to live in these rooms. I decided I would like it a lot, as long as I could add a kitchen and a bathroom and get rid of the tourists. 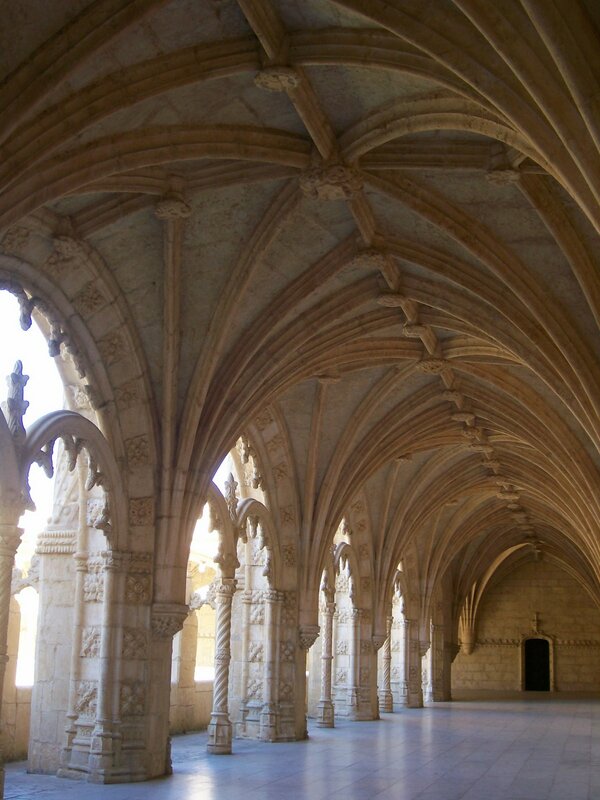 In 1983, the tower, along with the nearby Mostiero dos Jeronimos (Jeronimos Monastery) became a UNESCO World Heritage site. This beautiful monastery, near the beach, was built to provide support to the pilgrims traveling to the area. It contains a church that served as a house of prayer for seamen leaving the port and returning home. The original buildings were greatly expanded with money raised by taxing the valuable eastern spices and now contain the tombs of famous explorers, such as Vasco da Gama. The monastery is large and has many places explore. I spent hours wandering it's corridors, cloisters and lofts. Last year I read a book in which part of the story took place in this monastery. I found myself immediately back in Belem and could picture exactly what the author was describing. It put me right in the middle of the action! Also on the shores of the Tagus River, this monument proudly celebrates Portugal's role in the Age of Discovery during the 15th and 16th centuries. 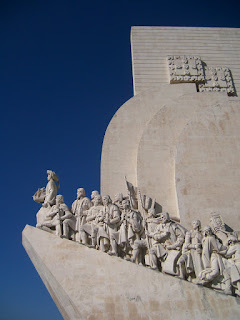 Representing a ship with sails, the statute is manned by 33 people important to Portuguese exploration lead by Henry the Navigator at the bow. I suppose I knew about Portugal's role in exploration, but this really brought it home for me. I left here wanting to learn more. The building inside contains a cultural center, meeting rooms, an exhibition hall, and an elevator to a fantastic view from the observation deck on top. Definitely the highlight of the day was my visit to the famous bakery serving these wonderful treats. Customers form long lines stretching outside for their turn to buy Pasteis de Nata. Pasteis de Nata are tiny pies made of a creamy custard in a wonderful light flaky crust. 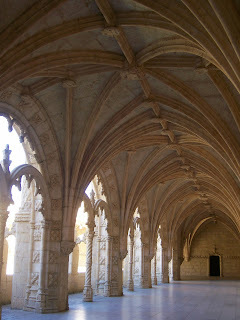 The pasteis were first made before the 18th century by the Catholic monks at the Jeronimos Monastery. When the monastery closed in 1820, Casa Pasteis de Belem became the first place outside the convent to sell them. A warning here...Do not make the mistake I did and buy only one! I promise that you will want more but you will not want to wait in the line again. Diet be damned! Go ahead and buy a few. You won't be sorry! I found them in downtown Lisbon but they were nowhere near as good.